Elizabeth Strout is the Pulitzer winning author of Olive Kitteridge and The Burgess Boys. Her new novel, My Name is Lucy Barton, may be her strongest work yet. I was lucky enough to get my DRC free of charge from Random House and Net Galley in exchange for this honest review. My thanks go to both of them. Right about here is where I often start examining various aspects of a new novel: setting, plot, character development, as well as its political undertones, if there are any, and there usually are. But this book defies that sort of compartmentalization. If you want a label for it, we could call it a fictional memoir, but that doesn’t really do it justice either. In fact the entire work is a gloriously detailed character sketch. The setting exists only to develop the character. The dialogue exists for the same purpose. Lucy Barton is developed as much by what is not said—or maybe more so—as by what is. The plot, which also exists to develop character, is fluid, apart from the fact that Lucy’s story begins in the hospital following an appendectomy and she is out by the conclusion. But in between, we bounce around to various times in the character’s life; we share her dreams, her memories, her phobias…and because Strout is part author, part magician, we just can’t put it down. Well, that’s not completely true. I was reading the first half at night, and suddenly realized that this was not a story I wanted impacting my own dreams, so I deliberately put it aside, choosing to reread a celebrity memoir before I turned off my light. I could fall asleep with Tom Petty in my head, but I would surely have nightmares with Lucy Barton. Lucy is so pathetically lonely that she hangs on the kind words of the doctor in the hospital, almost as if he were a surrogate father. There has been so little affection in her life. Strout uses repetition as figurative language in a way I haven’t seen done before. I’ve seen it used many times by other writers for emphasis; I’ve seen it used in a house-that-jack-built way by a couple of really strong writers to create suspense. Strout writes in the first person, as should be clear from the title, and in this case, repetition is used to build mood; in a number of places, I get the feeling that repetition is being used to make us believe something that may not be true. She protests too much; she is repeating herself either to convince us, or to convince herself. Hell, maybe it’s both. She repeats the same thing about a character from her past so often that I am half convinced the person she speaks of is imaginary; one has to wonder. Barton’s back-story is one of stark, terrible white rural poverty. The protagonist and her entire family lived in a rented garage; one room, freezing cold. The children in the family were so badly dressed, so badly groomed that other children would not sit next to them on the school bus, and they were whispered about at school, “equally friendless and equally scorned”. To some extent this could be called a mother-daughter novel, because almost all of the dialogue and much of the plot consists of the shared memories between Lucy and her mother, there in the hospital. As they echo one another, there is a cadence that shows that no matter what happened while Lucy was growing up, there is closeness between the two of them; Lucy would have more if it were offered. But the conversation is a kind of almost church-like call and response, a sort that is often seen among family members in smaller snippets. Much of the conversation is just neighbor gossip, but so much more is said in the way that Lucy and her mother speak to each other. Barton is thrilled to have her mother there, nearly cannot believe she has actually come to sit with her, and as they converse, bits and pieces tumble out, and other bits are suppressed, but our protagonist thinks about them, and so we are in on all of it. And the sense of horror builds, builds, and builds some more. Brief snapshots of horrific events blink in and back out again, juxtaposed with that which is common and normal—the terror of being locked in the truck as child, and then we are talking about Lucy’s own children going to a play date, and about Lucy’s appendix. And by giving us the briefest glimpse of the horror, and letting us know in the author’s own brilliant way that this snapshot is not the half of it, there’s oh, so much more—the effect is tremendously chilling, and at the same time, oh so human. And ultimately, whether her mother visits her or not; whether Lucy is financially well off or stone cold broke; whether she is married or single; Lucy is alone. Her solitude is positively visceral. This novel won’t be available until January 2016, and that’s a shame, because it’s an amazing October read. But we will take a good case of the shivers along with stellar literary fiction when we can get it, and this novel comes highly recommended. Absolutely brilliant! 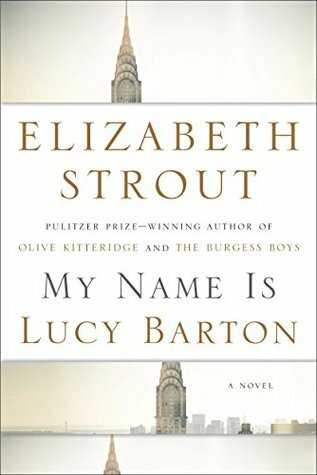 This entry was posted in literary fiction and tagged book blogger, book review, fiction by Pulitzer winning author, holiday books, literary fiction, My Name is Lucy Barton review, poverty stories, review My Name Is Lucy Barton by seattlebookmama. Bookmark the permalink.